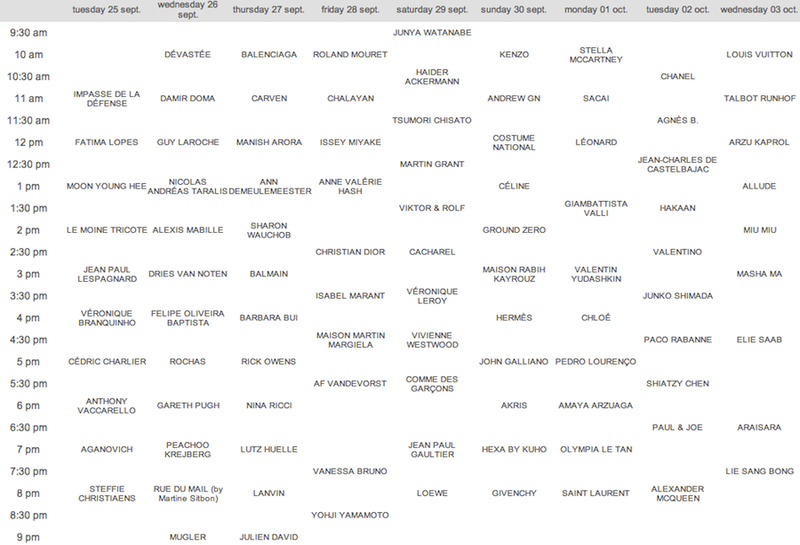 Too bad I won't be in Paris for the RTW shows. Anyway, thanks to NOWFASHION we can all stay up late and see all the new collections from our respective favorite maisons! In my case, I can't wait to see Moon Young Hee, Veronique Branquinho, Steffie Christiaens, Devastee, Damir Doma, Nicolas Andreas Taralis, Dries Van Noten, Peachoo Krejberg, Rue Du Mail, Gareth Pugh, Balenciaga, Ann Demeulemeester, Rick Owens, Lutz Huelle, Chalayan, Issey Miyake, Anne Valerie Hash, Maison Martin Margiela, AF Vandevorst, Yohji Yamamoto, Junya Watanabe, Haider Ackermann, Comme Des Garcons, Kenzo, Celine, Ground Zero, Akris, Hermes, Givenchy and of course the most anticipated show of the season Saint Laurent by Hedi Slimane!!!! So which shows are you dying to see?